I posted this once before, but thought we could kick off a new series here, so it was a good place to start. This is the real coroners’ office where Giles Kershaw works in St Pancras, on Pancras Road, which is also called Midland and Crowndale Roads in different stretches, just to confuse you. Whenever I walk past the place, I half expect to see Rosa peering glumly out of one of the windows. The building is part of the churchyard which is the setting for ‘On The Loose’. It’s hard to believe that you can walk to Leicester Square in a few minutes from this spot. It’s always peaceful there, and nearly always deserted. Yes these spots are a treasure. The building looks exactly as I pictured it in my mind while reading. Yes,it is peaceful,Admin. A couple of weeks ago,I visited this graveyard after looking round the Camley Street Nature reserve. That’s lovely too. The graveyard certainly contains some weird and wonderful grave memorials.Pure Victorian Gothic, with a touch of the Hammer Horror locations. I particularly liked the fenced off family tomb of the Soanes, very grand! I would never have pictured it this way. Block out the far left side and the building looks “American” mid-1800s, perhaps along the Eastern shore, A bit darkish, but add a large world globe containing drinks, a nice fireplace, a lot of books, a grill for the weekend, and A well-read M.R. James. Nice digs. Less gloomy than I pictured it — of course, it is missing the smells of mildew, embalming fluid and other unmentionables…. This building is really lovely inside the coroners courts are like the inside of a Victorian church black wooden seating and roof beams its a lovely building just off London’s beaten track. Right next door to the Brill reputed to be Londons oldest church – possibly one of the oldest in Europe i’m not too clear on that. And the Brill when u look at it carefully is built on an ancient mound or tun. 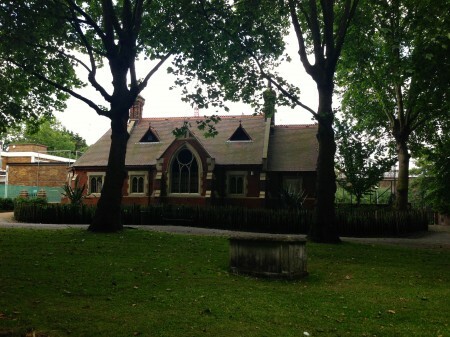 In the churchyard of the Brill is an unusual tree the Hardy tree which is surrounded by lots of gravestones displaced by the building of the railway serving the original upgrades and building of Kings X and St Pancras. Thomas Hardy supervised the relocation of these graves and therefore the Hardy tree, the roots from said tree run all through the graves now. Seems strange thinking of old Hardy – then a youngster- trying to sort all this grave business out before he returned to Dorset to get working on his recording of folklore and manic depression in his novels! Well Jan I did not know that! Search the blog and you’ll find photos of the Hardy tree. So many things I still haven’t done or seen in London. This area is a really interesting backwater altogether. A tributary to the river Fleet passes v close to the Brill and either the Fleet itself pr the same tributary beneath the Coroners court – damp is a problem, Just up the road is a VIctorian hospital for infectious diseases and just a few years ago some numpty thought this would be a good centre to bring into mainline use again. Just what you want near the centre of one of the worlds most cosmopolitan cities and international rail network connection some infectious patient legging it out of a hospital for unknown infectious diseases! At present such a centre does exist but is well away from the city centre and can be well guarded if the need arises doubtless sooner or later they will decide to save a few bob and move back into the centre of town!!! Look forward to more locations. London never ceases to amaze. It was seeing your last post on this that took me there one summer’s day. I love the whole place including the ancient church and the looming Victorian hospital. Also the John Soane grave that inspired the shape of post boxes (or is it telephone boxes – I forget). The nature reserve very nearby is also a gem. 22 years in London and I never knew! Thanks for highlighting for us…..ps. just reading ‘Film Freak’ – a joy. Thank you for the pictures, Lisa, especially the cemetery ones. Lovely.